A unique experience for the senses at Fairmont Le Château Frontenac! 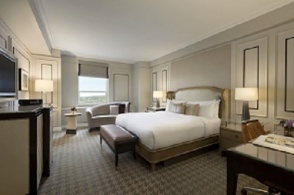 Your package includes accommodation for one night in a Fairmont Gold room with river view, a copious buffet breakfast and a delicious 5-course dinner at the Champlain Restaurant. In the exclusive Fairmont Gold Lounge, our dedicated team will extend a friendly, sincere welcome and will ensure that your every need is met. Throughout the day you can enjoy coffee, tea, an honor bar as well as complimentary cocktail canapés, served between 5:00 p.m. and 7:00 p.m. in a tranquil atmosphere of relaxing comfort.